This is the chorus on beautiful Whidbey Island this summer. We’re experiencing weather that’s more consistent with Southern California than the Pacific Northwest. It’s been dry and hot. We do get weather like this on Whidbey; it just usually shows up for a week or so in August, not from spring break until autumn. If you’ve got a garden growing at home, you know this problem. I’m sure you can relate if you accidently missed a day with the hose and went out to find your garden too wilted or crispy for even the slugs to eat. 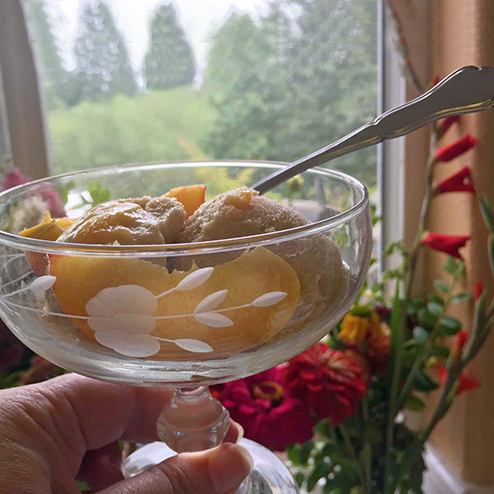 The goats’ sabbatical this year has left me time to find other ways to beat the heat, but it has left me without one of the main ingredients for my favorite dessert . Peaches are my favorite fruit. They’re a sure sign of summer, and this year they’ve come early. 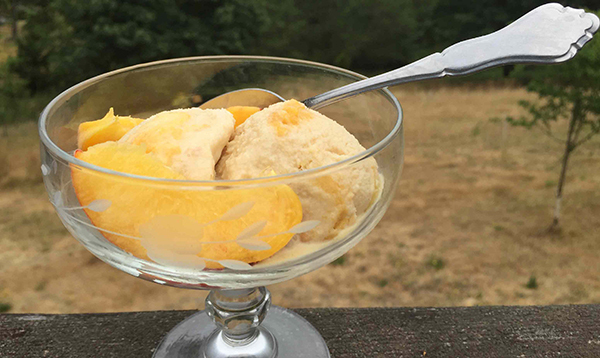 In all this spare time, I thought I’d whip up a new favorite dessert: fresh peach and dulce de leche ice cream. Heat the milk over medium heat, slowly and stirring constantly. Scalded milk will make your ice cream taste like burned cauliflower. Mix the sugar and egg yolks while your milk is heating. Once the milk is steaming, add it to the sugar and egg yolks. Reheat until it is steaming, but not boiling. Take the entire mixture and place it in either a glass or metal bowl. Once it’s cooled. put it in the refrigerator to chill. The mixture should be refrigerated for at least four hours to chill completely. • Mix all the ingredients in a sauce pan over medium heat, bring to a boil, but keep stirring. When it starts to brown, pull it from the heat and let it cool. If you overcook this, you’ll end up with toffee, so keep a close eye on it! 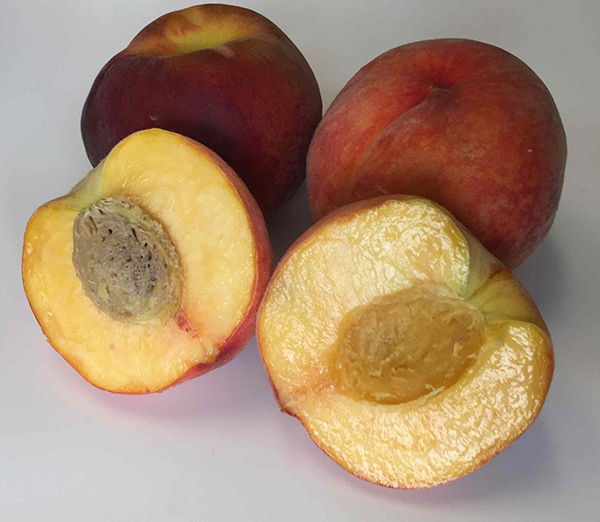 Cut two to three peaches into small cubes. Ideally you want to end up with two cups, so it depends on how much you snack while cutting. 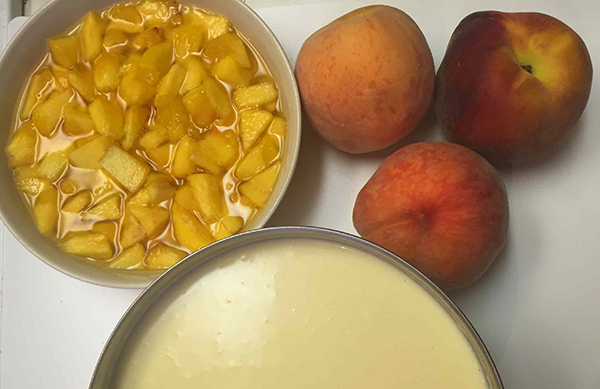 Once you have your two cups, sprinkle the peaches with one to two tablespoons of sugar and let them sit covered in the refrigerator until you’re ready to start mixing. 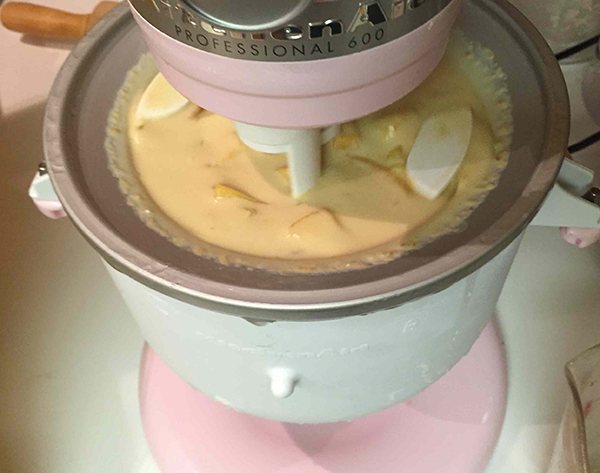 Once everything is cooled, you can mix it in an ice cream maker if you have it, or you could mix it together thoroughly with a spoon in a big metal or glass bowl. An ice cream maker will make it come together a little smoother and a bit like soft-serve, but you want to reserve the peaches until the ice cream is almost set. Either way you’ll likely have to put it in containers in your freezer to firm up. If you want it for dessert, get the ice cream mixed and into your freezer for two to four hours before you want to serve it. If you’re not using an ice cream maker you’ll want to freeze it in an airtight container overnight. Once it’s firm, put it in a bowl. Add a spoon, and maybe a sprig of mint. While you enjoy the cool, refreshing treat, could you do one favor for me? Hold a thought of a glorious overdue spring shower in your mind while you enjoy the bounty of summer. 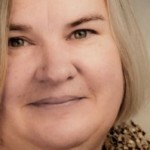 Vicky Brown, Chief Milkmaid at the Little Brown Farm, puts her passions on the page writing about food, agriculture and the tender web of community. All photos by the author.